Historic RCA Studio B, the legendary “Home of 1,000 Hits,” the site where many classic songs from Nashville’s golden age were recorded, by artists such as Elvis Presley, Dolly Parton, Don Gibson, The Everly Brothers, Roy Orbison, Connie Smith, and Charley Pride. Over 35,000 songs were recorded at Studio B, including more than 200 by Presley, at what was his favorite studio. Tours will begin and conclude at The Country Music Hall of Fame and Museum. Please see Additional Information section for more details. Historic RCA Studio B opened in 1957 and was once the recording home of popular music titans such as Elvis Presley, Chet Atkins, Eddy Arnold, and the Everly Brothers is both a classroom for Nashville area students and a popular cultural attraction. RCA Studio B first became known as one of the cradles of the “Nashville Sound” in the 1960s. A sophisticated style characterized by background vocals and strings, the Nashville Sound both revived the popularity of country music and helped establish Nashville as an international recording center. Hitmakers in Studio B have included Eddy Arnold, Waylon Jennings, Bobby Bare, Dolly Parton, Jim Reeves, Willie Nelson, and Floyd Cramer, among others. For many years, Country Music Hall of Fame inductee Chet Atkins managed RCA’s Nashville operation and produced hundreds of hits in Studio B. 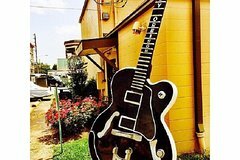 Studio B has also been home to numerous innovations in recording practices, including the development of the “Nashville number system,” a musician’s shorthand for notating a song’s chord structure, which facilitates the creation of individual parts while retaining the integrity of the song. Tours of Studio B depart hourly between 10:30 a.m.-2:30 p.m. daily from the Country Music Hall of Fame and Museum. In order to guarantee your spot on a tour, please follow the instructions listed on your voucher immediately after purchase.